Spring City Arts Council presents The Spring City Bluegrass Festival Saturday, August 06, 2011 in Spring City, Utah, featuring CrosStrung and more. One of Utah’s newest up and coming Bluegrass and Celtic bands. Entertaining with their tight harmonies and hot instrumentals is what this fun family group is all about. Not only do they switch off playing each others’ instruments, on occasions 3 or 4 of them can be seen playing on the same instrument at the same time. State champions Dan Riggs on fiddle and Sarah (Cluff)Riggs on mandolin and guitar, are joined by Old Time Fiddler Junior winner, Leah Cluff on fiddle, Daniel Cluff on banjo, guitar, and electric bass, Emma Cluff on acoustic bass, and Sheri Cluff (mom) on guitar, banjo, and bodhran. 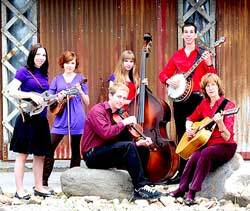 The band enjoys performing a wide variety of bluegrass, celtic and acoustic music, adding their own unique style. This wonderful, fun Bluegrass Festival will be held in Spring City, location to be determained. The festival will begin at 4:00pm and run until 10:00 pm. There will be great music and food, overnight camping is available.